The U.S. economy could get a boost in the fourth quarter as tumbling oil prices support increased consumption and lower costs for manufacturing companies and shipping services. With oil prices down 42 percent since last June to $63 per barrel, consumers save approximately $200 million per day in gas expenses, which may be redirected toward revitalizing holiday shopping following a shaky 2014 Black Friday weekend. The decline in oil prices should re-route money from oil and gas companies to retailers and restaurants – sectors that offer more growth potential for the consumer-driven U.S. economy. Lower oil prices will add momentum to the already strong employment outlook as hiring in retail trade, restaurants and transportation services rises. Energy sector employment, particularly oil and gas extraction, could potentially lose some momentum, but this market segment is relatively small compared with the sectors that will expand. Even in metros with significant energy employment such as Houston, where nearly 5 percent of the employment base is directly tied to the oil and gas sector, hiring momentum should only ease marginally. Houston’s addition of 123,000 positions over the last year was the highest in the nation, and this vibrant city will likely continue to add jobs at a steady pace through 2015. Important factors will be the depth and duration of the lower prices. 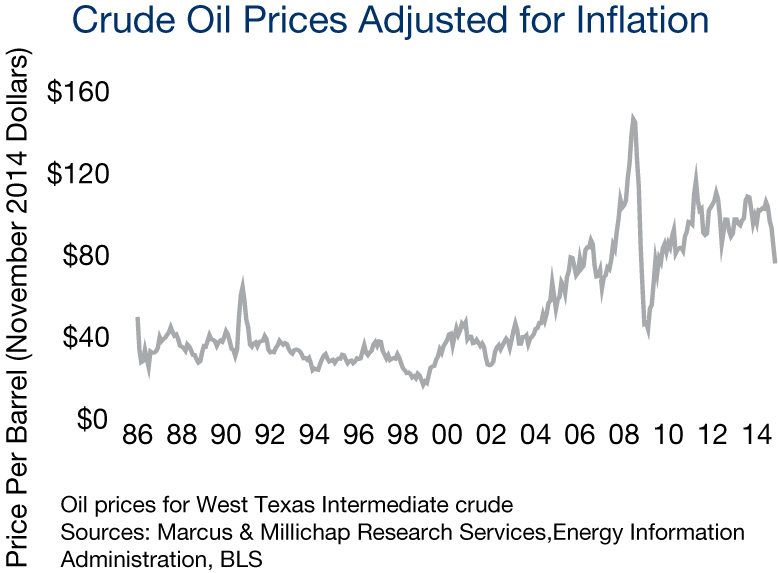 Prior to the price spike at the onset of the recession, inflation-adjusted oil prices were dramatically lower than they are today. Several newer oil extraction companies are dependent on $80 per barrel prices, and they face heightened risks should oil remain in the $60 range for a prolonged period. However, most drilling and fracking operations remain profitable, and though a prolonged downturn in prices could increase pressure on oil companies, risks remain limited. Considering that much of the pricing pressure has been driven by Saudi Arabia, which also needs the prices closer to the $80 mark, it is unlikely prices will remain low at current levels for a prolonged period. Reduced oil prices offer renters a modest reprieve in their monthly expenses. Lower-income households spend a disproportionate share of their after-tax earnings on energy; approximately 21 percent for households earning less than $50,000 per year. These households, which often rent, will benefit from reduced prices at the pump. In addition, the majority of the jobs that will be created as a byproduct of this change will be in sectors such as restaurants, retail and shipping, positions predominantly staffed by people who favor apartment housing. At least through the holidays, much of the savings that households reap from the lower oil prices will likely go toward retail spending. Though the holiday season got off to a weaker than anticipated start, retailers hope to recover lost momentum in the remaining weeks and achieve their targeted 4.1 percent growth. National retail vacancy fell 40 basis points in the first three quarters of the year to 6.8 percent, and additional tightening in the fourth quarter will place U.S. vacancy at 6.6 percent at year end. This entry was written by marcusmillichap, posted on December 10, 2014 at 7:12 pm, filed under Research and tagged Commercial Real Estate, Oil Prices. Bookmark the permalink. Follow any comments here with the RSS feed for this post. Post a comment or leave a trackback: Trackback URL.